At one point or another we will all be in need of computer repair services. In most cases these devices give no warning of their impending demise. New security loopholes are discovered on an almost daily basis, which make our computers more vulnerable to attacks in addition to the general wear and tear they already experience. As much as technology evolves, the problems we encounter seem to also be evolving with it. 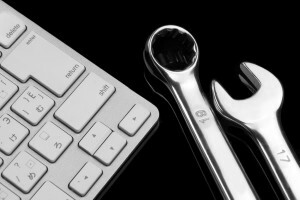 Not all computer repair work needs to be done in your home or at a computer repair store. Problems may arise at a time when you desperately need to use your computer - perhaps you have some deadlines approaching and you laptop chooses to act up on you. It would not be ideal to have to start calling up repair businesses in search of the right one to take your computer to, and it is hardly ever easy to get someone to come out to you immediately. This puts you in a tight spot if you are trying to meet a deadline. Luckily, our team of expert repair technicians have a solution. A significant number of computer issues can be resolved remotely over an internet connection. Our team of repair techs are at hand to assist you in these situations. Once a remote computer repair session has been arranged, one of our technicians will guide you through the process of connecting to our office. Once connected they will be able to diagnose and give you an analysis of the problem while you watch on from the other end. Once we have identified what is wrong, we correct it and get you back to work meeting those deadlines again. If it is an issue that cannot be resolved remotely, you will be advised of this promptly and given the option to schedule an emergency in-home service call. Remote services have a wide range of advantages over conventional methods when the issue is not a hardware problem, in which case something would need to be physically repaired or replaced. If it is a software problem, accessing and sorting it out remotely would save you the time and hassle that it would take to travel to a computer repair shop with the machine. This is not even taking into account the carrying around that you may need to do, and all the disconnections and eventual re-connections that this may warrant. In general, our remote services are a faster, less expensive, and a more convenient way of providing computer support in Los Angeles and beyond. By using our remote computer support service you will significantly cut down on home computer repair time. Ordinarily, when you bring a device into a computer repair shop, the procedure usually includes filling forms and leaving the device for a repair technician to look at when a bench space is available. Our remote service ensures that you have someone address your issue promptly. Over the phone, you can discuss the problem directly with a technician and watch the work in real-time on your monitor. There is a much shorter turnaround time that is associated with remote servicing when compared to in-store repairs, and often significant cost savings. Both Apple and all brands of PC computers can be accessed and repaired remotely. MacBook, MacBook Pro, iMacs, Dell, HP, Toshiba and all desktop and laptop computer makes and models are fixable over the internet. Depending on your internet connection, the remote access software download and installation process should take a few minutes at most. PC Fixer is a reputable Mac and PC repair company, with 17 years in the business and over 10,000 repairs completed. You can rest assured that your privacy will be maintained and your information will be handled securely. Your trust is of great value to us, and as such we will make sure we keep it. We believe in building lasting relationships with our clients, so it does not have to end when your first remote session does. That is why we are different. We intend to be the first, if not the only company, that comes to mind when you need any help with computer related issues. Call us today at 310.948.0588 or send an email to info@pcsfixer.com to discuss any computer issues you might have, or to request additional information about out remote support services.